Who says nachos have to be spicy? After trying these crispy, creamy dessert nachos, you'll never think of nachos the same way again. 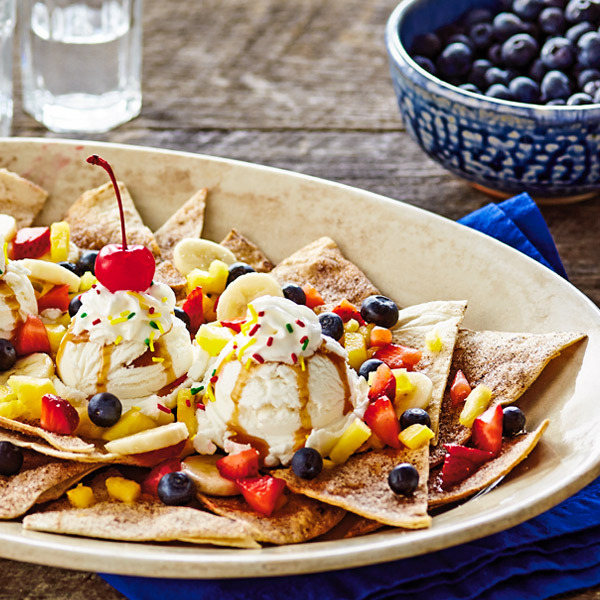 Our easy dessert nacho recipe features mounds of ice cream surrounded by assorted toppings and homemade cinnamon chips. Busy hosts will appreciate how quickly they can pull together this delicious dessert, a perfect ending to a birthday or Father's Day dinner celebration. Our ice cream nachos recipe makes one family-sized serving, so grab some spoons and get ready to share this sweet and simple treat. Preheat oven to 350°F. Melt butter. Brush butter over tops of tortillas. Then sprinkle cinnamon sugar over the buttered tortillas. Use a pizza cutter to cut each tortilla into nacho-chip-size pieces. Transfer chips to a baking sheet, sugar side up. Bake about 10 minutes until chips are browned and crispy. Let cool. Place a scoop of vanilla ice cream onto a plate and surround it with the baked chips. Add your choice of toppings. Tip: A 6-inch tortilla makes about 8 baked chips, so plan accordingly. You’ll probably want to use several tortillas to make enough for the dessert and for taste-testing!